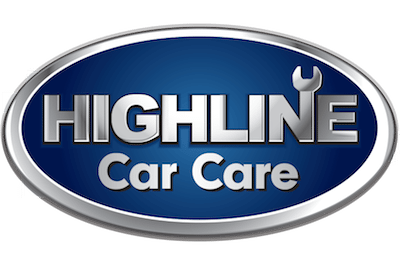 A tire rotation and oil change go hand in hand because each uses a timing and mileage interval nearly identical to the other. Simply put, your tires should be rotated every 5,000 to 8,000 miles, which is roughly the same as many modern vehicles’ oil change schedule. A tire rotation does for your tires what an oil change does for your engine. Rotating your tires keeps each one operating efficiently, promotes even treadwear and will ensure that your tire pressure is at the optimum level. There is no greater frustration for car owners than costly repairs, including replacing tires. Tire rotation help owners be proactive about preventative maintenance, minimizing the need for large repairs and kicking the can on tire replacement far down the road. While we have your vehicle on the lift, we will also perform our standard inspection to make you aware of any other details about your car that you should know about. This is actually one of the benefits of having your tires rotated by an auto repair shop. One of the biggest requests local mechanics receive is for a ‘tune-up’ on a vehicle. 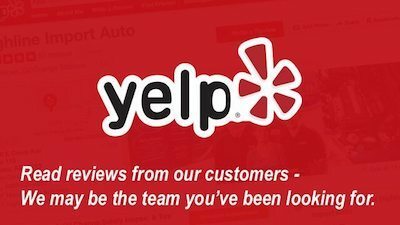 Our inspection serves as an opportunity to present each customer with recommendations, if any, of what they may want to have tuned up during their visit. If you’ve never had a tire blowout on the freeway, it’s pretty common for drivers just like you to be curious about what happens. There are many different ways a car tire can blow out, and how you feel it in the steering wheel and on the road will differ from vehicle to vehicle; how much weight the vehicle is carrying also makes a difference. You will make decisions on what tires you want on your car. You will notice if a tire seem low or flatter than normal. You will use the air machine at a local gas station to fill your tires. You will ask about getting your tires rotated. Inspecting the outer treads of the tire. Inspecting the center tread of the tire. Inspecting the outer wall of the tire. Inspecting for uneven wear of the tire. Inspecting for a scalloped tire. Inspecting for excessive wear around the entire tire. Inspecting for dips in your tire edges. Inspecting for damage to your tire which requires repair. Inspecting for unrepairable damage to your tire. Inspecting for a bulge or bubble. There is a lot more to inspecting a tire, and any deficiency in the above areas can lead to a blowout on the freeway, or anywhere else you may be. Tire rotation not only keeps your treads wearing evenly, but will allow an auto repair shop expert to inform you of any risk you’re taking using your current tires. It also gives you an opportunity to begin planning for tire replacement, knowing you have two months of tread left or 12. If you’re familiar with the Lincoln test, you are already equipped with the best DIY tire test. 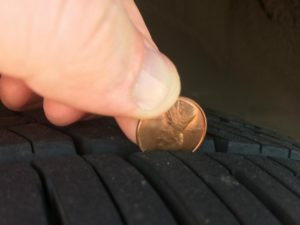 For those unfamiliar with the Lincoln test, you use a penny to get an idea of whether or not your tires need to be replaced or will need to be replaced soon. Take a penny and turn it upside down so President Lincoln’s head is now down. Place the penny in between two of the tire treads. If you can see all of Lincoln’s head your tires need to be replaced. If you can see a portion of the top of Lincoln’s head, you are still above the recommended 2/32” depth, however you will need to look at replacing your tires soon. The penny test tells you if your tires need to be replaced. Keep them rotated to preserve their life. You want to conduct this test on several of the treads for each tire. Even if there are only sections of your tire under the recommended 2/32” tread depth, you’ll still want to replace the tire. It’s that old saying, “a chain is only as strong as it’s weakest length,” your tire is only as good as it’s shallowest tread. For a more specific reading you can purchase a tread depth gauge. If your vehicle is used for professional purposes, it is a good idea to regularly check your treads to be consistent with regulations and a gauge will give you a precise reading on the state of your tires. You can purchase a tire tread, like this one, for a few dollars at any store that sells tires or auto accessories or on Amazon. No matter what type of tire you select for your vehicle, rotating them around the same time as your vehicle gets an oil change is a good idea. This will ensure they last as long as possible. In terms of how long you should expect a tire to last overall, it all depends on the quality of tire you choose in addition to your vehicle, driving style and road conditions the tires are subject to. Going into tire grading systems is beyond the scope of what we’re covering here, however, each tire manufacturer provides extensive information on their website regarding the different models of tire they offer and which cars they are best suited for. A good quality, medium grade tire should last around 30,000 to 45,000 miles and provide a nice, semi-quiet ride. Lower quality tires will be noisier on the road and will last approximately 20,000 to 30,000 miles. If you cannot remember the last time you had your tires rotated, it’s a good idea to schedule an appointment to have it done in the next week or so. By having your tires rotated soon you will make certain that you’re not furthering any wear in particular spots and have a starting point to know when your tires should be rotated next. If you’re not sure whether you need new tires or just a rotation, fill out this form and we will help you!